Steven Leach Group - Arbonne International Inc. has newly established their first office in Taiwan. Arbonne International Inc. has newly established their first office in Taiwan. Arbonne International Inc. has newly established their first office in Taiwan. Petter Morck, founded Arbonne International in 1975 and its headquarters are situated in Irvine, California. Petter was a Norwegian and possessed a passion for skincare. His product vision for unparalleled quality, purity, safety and beneficial results was as important as his desire to give everyone the opportunity to achieve financial independence. The trunk and branches create a dialogue throughout the space. The floorplan uses curved lines as a guide to steer direction and separate different spaces. Beyond circulation, the space plan also offers versatility to maximize functionality, and can be used as a multipurpose area. 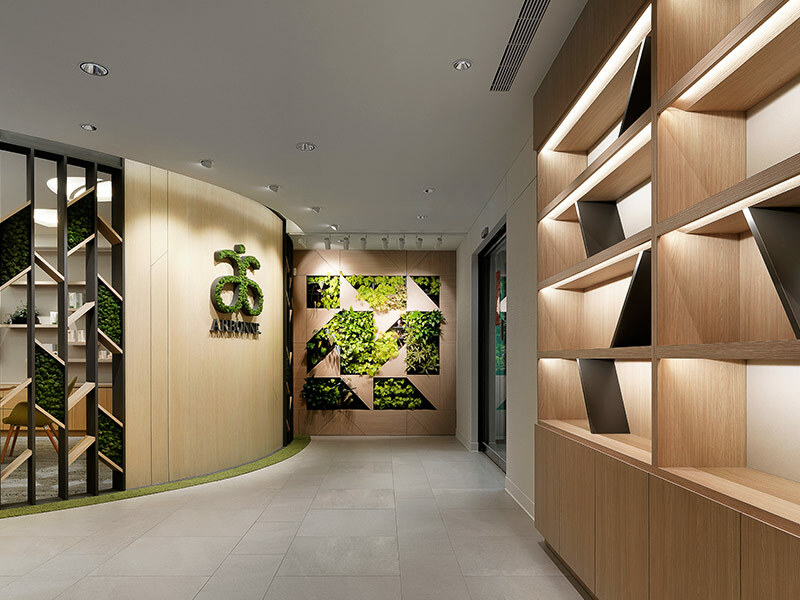 Upon entering the experience center, visitors are greeted by a Norwegian-moss decorated logo wall and branch-like perforated partition, symbolizing the lush growth of trees. The eye-catching green wall is decorated by plants of different colors and classifications to evoke the rich visual interest of a forest. 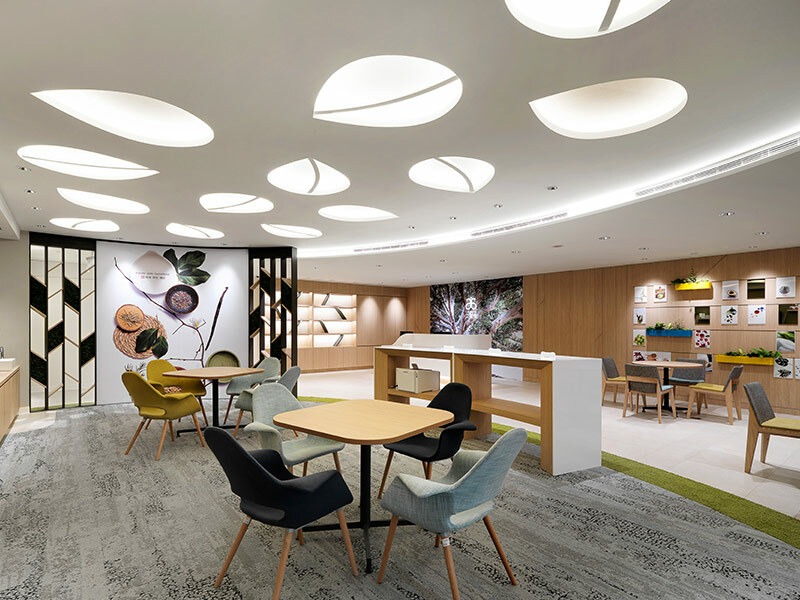 The white-colored reception counter echoes the purity and safeness of Arbonne’s products. A large graphic wall of tree imagery paired with the clean Arbonne logo strongly reflects Arbonne’s branding image: natural and pure. 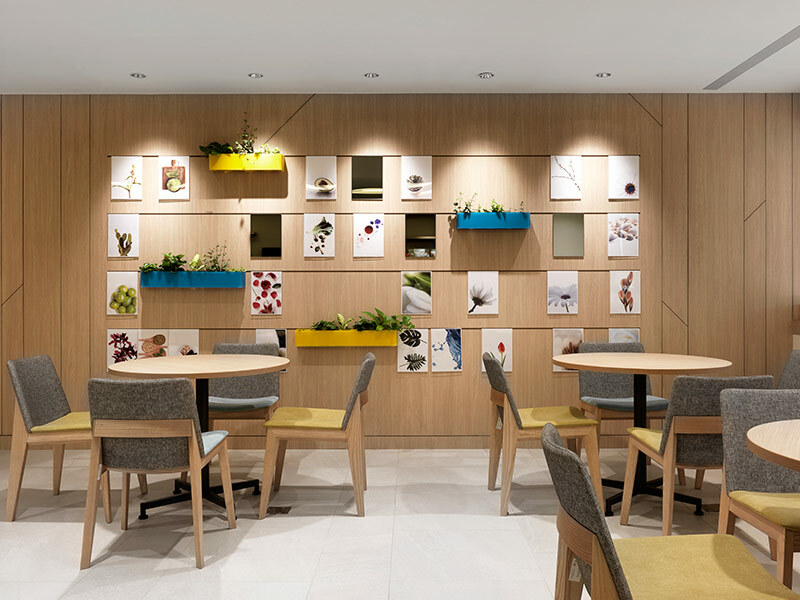 The centrally located product presentation and experience area carries nature into the interior, through details such as the leaf-like shape of the lighting, texture of wood at smooth surfaces, and the earth-tone and texture of the carpet. The use of various plants and green aesthetics throughout gives the space a fresh and alive feeling, just like walking into nature. The overall feeling is comfortable, relaxed, and natural. The office has achieved LEED certification, in an effort to not only provide a space of visual and tactile enjoyment, but to also carefully utilize green materials – such as paints, flooring – that are healthier for the human body and less harmful to the environment.